Furio Pietribiasi is responsible for the operations of Mediolanum in Ireland and in Luxembourg, and plays a significant role in the continuing development of the IFSC and is a member of the council of IFSC Ireland and he is part of the Department of the Taoiseach’s IFSC working groups for funds and asset management. 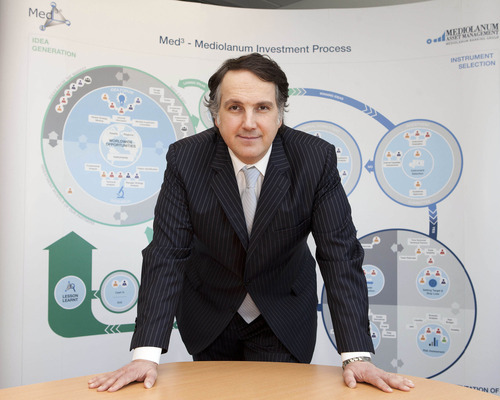 Mediolanum has had a presence in Ireland since 1997, and today employs over 150 people in the country, directly and indirectly. It plans to recruit more later this year, when it completes a major redevelopment of its offices on Shelbourne Road. 7.00 a.m. I awake to the sounds of my eleven month old twins Sean & Meabh in the next room. Morning time is family time and when I am not travelling with work I relish spending this time with my wife Aoife and the children. It’s not quite the calm before the storm but it is my favourite part of the day. Before leaving for work I check my emails and use the daily commute to Ballsbridge to follow up urgent issues by phone. 9.00 a.m. Arriving at the office, it is already buzzing with activity. Our main distribution markets are continental European and servicing this market means our Investments Team have been in since before 7. I stop by the desk of our Head of Investments, Stefano De Chiara, to get an update on what's been happening overnight. Thankfully it’s been quiet, so I grab my first espresso of the day before heading into my office, fire up my computer and go through my inbox as my PA Cristina updates me on changes to the day’s schedule. 9.40 a.m. I head into the office of Michael Brady, Managing Director of our insurance company Mediolanum International Life Ltd (MILL) of which I am also a director. This morning we’re talking about the progress in our office renovation works as due to expansion we are taking more space and the entire building is undergoing a major refit due to be completed by June. The extra space will host, among other things our MedLAB� R&D innovation centre. MedLAB� is central to our open innovation platform, which also leverages crowdsourcing, providing access to more 'brain power' outside of Mediolanum’s 'four walls'. It allows us to centralise the management and administration of all our financial product know-how and intellectual property from across the Mediolanum group. The media room, which is being fitted out with specially designed ‘immersive’ videoconferencing technology is very much the focus of our attention. I want everything to be just right when we use the room to broadcast to the most important convention of the year next month for our 4,300 strong sales network in Italy. Being an Italian, I am passionate about the finer details and aesthetics, so these meetings probably run on for longer than Michael would like! 10.30 a.m. I meet again with Stefano to get an update on the markets, some detail regarding the structuring of a new insurance product which takes advantage of a current market opportunity and also some possible investment ideas generated by Med™ our proprietary investment process which drives our active management decisions. Specifically the process is about spotting investment opportunities created by the fundamental inefficiencies of capital markets. These however will have to wait for our Investment Committee meeting tomorrow as I have to leave for an external meeting. 10.45 a.m. The meeting is for the Department of the Taoiseach’s IFSC working group for funds, of which I am a member. This group considers issues relating to the future of the funds industry here. Today, the meeting is focusing on innovation in financial services and the fantastic opportunity to take advantage of the wealth of technology services in Ireland. After all, some of the world’s biggest players in the technology sector are based here. 12.40 p.m. A lunch meeting with Frank O'Dwyer, chief executive of the Irish Association of Investment Managers, of which I am deputy chairman. We meet at my favourite Italian restaurant, the Unicorn on Merrion Row. I order my usual: a glass of Prosecco and Pasta Carbonara, which often reminds me of my hometown. Our main topic of conversation is an ongoing project aimed at communicating and promoting to the foreign ambassadors to Ireland the opportunities offered by the IFSC to foreign investment managers and financial institutions in general. Before leaving I am already on my third espresso! 2.00 p.m. It’s back to the office for a meeting with the product development team, a six-strong team headed by Conor Owens, to discuss in more detail the structuring of the new insurance product. We also take the opportunity to follow up progress for the summer launch of several new fund products developed using our MedInSynC™ product development process. It’s our way of quickly industrialising the best product ideas that we come up with - both in-house and in collaboration with selected international partners - and bringing them to the market. As a company, we are strong believers in permanent incremental innovation as opposed to random, intermittent or one-shot innovation which simply don’t work well in today’s market. Our products don’t depend on ‘revolutionary’ discoveries but on the ability to combine and modify existing technologies or techniques in an innovative way to create new fund solutions and to constantly update the ones we already have. 2.30 p.m. An informal meeting in my office with our senior operations manager, Karl Burden, to get an update on current developments and identify some priority issues, but having been gone for most of the morning it is interrupted by external phone calls and members of staff popping in to take advantage of my presence. I don’t mind these interruptions, as I’m not easily distracted and to be honest with my core team I much prefer talking face-to-face than using tools like email or even the phone. Communication and timing is important in our business and an open door policy facilitates the quick decisions that are often needed. 3.30 p.m. After my fourth cup of espresso, I’m in again with Michael to discuss our ongoing recruitment. Like the office refit, this area is another key priority for us at the moment, as our human capital is central to the success of our organisation. Today we also discuss a few new ideas in relation to coaching and mentoring. Developing talented people within the organisation is something that we invest a lot of time and money in. 4.00 p.m. Another external meeting, this time with an international asset manager to follow-up on our relationship, which includes discussions about our confidentiality agreement and terms to share our intellectual property. The way our company is structured we work with a lot of external partners, but we’ve developed a unique approach to engaging with them in a way that protects our intellectual property and technical know-how. It is based on a working arrangement that is quite widespread in the technology industry, but we think it works particularly well in the world of asset management, too. 6.00 p.m. Back to the office to catch up and respond to the day’s emails and missed calls before my Spanish language lesson with our visiting tutor. This isn’t beginner-level stuff, as my Spanish was once better than my English, but because of a significant presence in the Spanish market, it makes absolute sense for me to invest in bringing my conversational Spanish back up to scratch. Today’s session is enjoyable as my tutor gets me to talk about art and football as well as business. Fantastico! 7.30 p.m. Time for my dinner appointment with the newly-appointed CEO of one of Mediolanum’s biggest partners. It’s a getting-to-know-you meeting, so we spend the evening discussing our mutual perspectives and our views on current and future trends, challenges and opportunities. We’re quite strong subscribers to the ‘make it or buy it’ logic, which makes outsourcing a fundamental part of our business model As the after-dinner coffee (espresso for me) arrives, we round off the evening talking about how best we can align our companies’ respective strategies and priorities. 10.00 p.m. Home. Aoife jokes that I’m “home early” and we chat about how the twins are doing. Aoife likes to go to bed quite early at the moment, so I stay up to catch up with Italian news and given that it’s Wednesday, I also flick over briefly to catch up on the weekend’s Serie A football highlights, before watching one of the many programs on Italian politics, which keeps me tuned until midnight while I read and reply to the emails that I did not manage to see during the day, and then head to bed.